Armstrong Street Medical Centre is a private billing clinic. 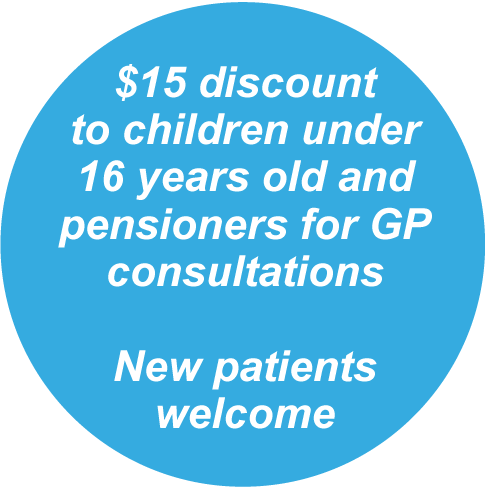 Pensioners and Children under 16 years old attract a $15 discount. 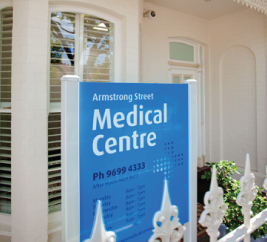 Armstrong Street Medical Centre is a private billing clinic. Pensioners and Children under 16 years old attract a $15 discount. All patients will need to finalise their accounts at the time of consultation. Payments can be accepted in the form of cash, EFTPOS, MasterCard or Visa. Medicare rebates can be claimed from Medicare into the patient’s bank account if they provide an EFTPOS card at the time of payment. Mental health consultations, medical reports and dietitian and diabetic educator consultations attract different fees. Some procedures, dressings, vaccines and other items may also incur a separate fee. Please ask at reception for a full explanation in relation to our fees if required. Medical examinations such as for insurance, pre-employment, taxi driver’s licences, truck driver’s licences and superannuation purposes do not attract a Medicare rebate and must be paid for at the time of the consultation. A $15 surcharge applies after 6pm Monday to Friday and on Saturday to the above fees. Different fees and rebates apply after 1pm Saturday. Fees vary with the length of the consultation. As an example for a standard 15 minute consultation, the following applies. General practice patients: It is requested that general practice appointments be cancelled at least two hours prior to the appointment by calling the clinic on 9699 4333. General practice appointments cancelled within two hours, or failure to attend an appointment will incur a cancellation fee of $80. Cancellation of appointments before 10 am Monday to Friday and 11am Saturdays are required on the previous working day. This applies to both phone and online bookings. Mental health sessions with Dr Zappia: Mental health sessions with Dr Jo-Anne Zappia require 48 hours’ notice if cancelling or postponing an appointment, otherwise a cancellation fee will be charged. Cancellations within 24 hours, or failure to attend an appointment, will incur a cancellation fee of $80. A cancellation fee of $40 applies if only 48 hours’ notice is provided. Our regular patients may be eligible for a range of Medicare funded medical assessments. These can be initiated by the patient’s doctor after discussion with the patient. An appointment with the practice nurse will be then arranged for the medical assessment to be performed, after which the patient will attend the doctor. This visit will be bulk billed for eligible Medicare card holders. GP Management Plan - for patients with chronic disease, in order to arrange a comprehensive written plan of management of the chronic medical condition. Please note for GP Management Plan Reviews a private fee may apply. Team Care Arrangement for patients who have had a GP Management Plan put in place and who have complex care needs, and who require other health care providers and allied health workers to be involved in their care. This benefits the patient by allowing them to access Medicare funded allied health support, such as for dietitians, podiatrist, physiotherapists, diabetic educators and exercise physiologists, to assist in the management of chronic disease. Please note for Team Care Arrangement Reviews a private fee may apply. Patients aged 75 years old or older are eligible for an annual in depth health assessment, in order to identify early signs of physical and psychological illness, memory and cognitive impairment, and improve the health, independence and quality of life of these patients. A surcharge of $15 applies to sessions on Saturdays. There is no discount for pensioners or children in the case of psychologist appointments. Consultations with the psychologists require 48 hours’ notice if cancelling or postponing an appointment, otherwise patients will be charged the cost for the session.